We’d love your help. 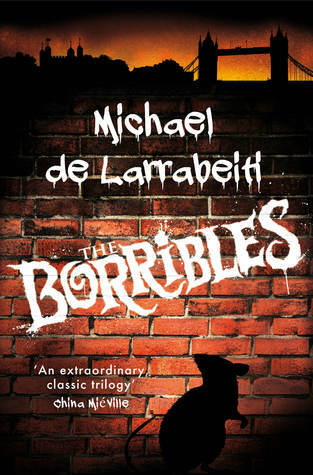 Let us know what’s wrong with this preview of The Borribles by Michael de Larrabeiti. This is the first book in a rebellious adventure trilogy for readers of all ages, set in a shadowy, alternate London. This edition features extra material, such as a heartfelt introduction by author China Miéville, who says 'the Borribles were, and are, my heroes'. London's forgotten corners This is the first book in a rebellious adventure trilogy for readers of all ages, set in a shadowy, alternate London. This edition features extra material, such as a heartfelt introduction by author China Miéville, who says 'the Borribles were, and are, my heroes'. London's forgotten corners hide a rebellious community of small outcasts - the Borribles. And apart from their pointed ears, their childlike appearance allows them (mostly...) to say one step ahead of the authorities. They live by their wits, high spirits and a few Borrible laws -- the chief one being, 'Don't Get Caught!' This motto will stand them in good stead, as the Battersea Borribles prepare for their greatest adventure of all. One night, they discover one of their ancient enemies, a giant rat-like Rumble, in their traditional territory. They've fought hard for their dwellings in the city's forgotten corners, so clearly something must be done. Fearing an invasion, an elite group of Borrible fighters set out on what will become known in legend as the Great Rumble Hunt. So begins the first of three epic adventures in Michael de Larrabeiti's classic trilogy, where excitement, violence, low cunning, greed, generosity, treachery, and bravery exist side by side. To ask other readers questions about The Borribles, please sign up. Recommends it for: Jess, Marlee,, maybe Beth? As someone else mentioned in their review, this is exactly the kind of book I used to think "Mum would kill me if she caught me reading this!" I remember it as a violent modern urban take on the Lost Boys (the originals, not the 80's vampires), and it honestly scared the heck out of me as a kid, but again, like someone else said, I spent half my teena As someone else mentioned in their review, this is exactly the kind of book I used to think "Mum would kill me if she caught me reading this!" I remember it as a violent modern urban take on the Lost Boys (the originals, not the 80's vampires), and it honestly scared the heck out of me as a kid, but again, like someone else said, I spent half my teenage years wishing I could run away and be a borrible. I first read this book when I was twelve, and was instantly captivated. I even went through a phase of wanting to run away and become a Borrible (in fact, I still do now). I recently read it again, many years later, and found all of the magic was still there. This is the perfect boys' book- fast paced, exciting, violent and just rude enough for you to think 'Mum will kill me if she finds me reading this'. Every twelve year old should have a copy to treasure. It was children's fantasy without the cheese, set in a wonderfully dark and grimy London of the late 70s. The Borribles are...kinda like the Lost Boys, but better. And their mortal enemies are kinda like the Wombles of Wimbledom Common, but far far worse. Seriously, I loved every second of this, and I need to read the next book because NOOOOOO that can't be how it ended. Borribles? Great idea. Loved 'em, would've wanted to be one, would've been a little frightened of being one. And great use of geography -- this is 'urban' fantasy Peter Pan-style, as drawn from the kids hanging around Tottenham High Street, as soaked in London geography, as it is a punky, proletariat reworking of Edith Nesbit or Narnia. I'm torn, because I loved the premise, I loved the ideas. Where it falls down -- and perhaps I wouldn't have noticed this as a child -- is the execution. It's all Borribles? Great idea. Loved 'em, would've wanted to be one, would've been a little frightened of being one. And great use of geography -- this is 'urban' fantasy Peter Pan-style, as drawn from the kids hanging around Tottenham High Street, as soaked in London geography, as it is a punky, proletariat reworking of Edith Nesbit or Narnia. I'm torn, because I loved the premise, I loved the ideas. Where it falls down -- and perhaps I wouldn't have noticed this as a child -- is the execution. It's all very well to want to write your reaction to staid, safe, edifying upper-middle-class children's literature, but it has to stand as a plot on its own. If as a child you loathed and feared the Wombles, this is the blood-spattered revenge fantasy you've been looking for. If you're not in on the 'Rumbles' joke, it's a long and gleefully gory battle between Our Heroes and some vague antagonists who...well, haven't really been established as any nastier than the Borribles themselves. A fast-paced action fantasy for adolescents/YA in which the author enjoyed doing a takeoff of the Wombles...except his Rumbles are unpleasant and materialistic instead of being gentle off-the-grid recycling hippies. They run afoul of the Borribles, Dickensian street kids who inhabit abandoned buildings and scavenge (ie steal) a living off the markets--and never grow up. Any reader too young to remember the Wombles will be a bit lost, and a knowledge of Oliver Twist would be of help. It held my at A fast-paced action fantasy for adolescents/YA in which the author enjoyed doing a takeoff of the Wombles...except his Rumbles are unpleasant and materialistic instead of being gentle off-the-grid recycling hippies. They run afoul of the Borribles, Dickensian street kids who inhabit abandoned buildings and scavenge (ie steal) a living off the markets--and never grow up. Any reader too young to remember the Wombles will be a bit lost, and a knowledge of Oliver Twist would be of help. It held my attention, as the writing just sweeps you along, but. It's a big "but". A little too much is put down to "luck was with them", a phrase that was so often repeated as to become annoying. The second part of that "but" is that during the "war" scenes, the Borribles are a wee bit too indestructible. For what it is, it's an OK read, but it could have been a bit better. The last paragraph made me very angry indeed, but then I suppose it was meant to. Another "but" is that for kids (and yes, they live for years, but live as kids) they're a bit verbose; the dialogue was less than convincing. No street slang (and the author could have invented his own)--not even much in the way of Cockney. Where does slang come from? From young people. Duh. Apparently the author didn't know many. This review has been hidden because it contains spoilers. To view it, click here. I remember this as being a lot better than it was. Honestly I barely remember reading it, although certain details were familiar when I got to it. One of my issues is the inclusion of the map at the front of the book. Yes, it's nice to have one, but it also made me realise that they essentially cover 3, maybe 4 miles (as the crow flies)... a distance that could very probably be walked by a moderately fit adult in an hour, hour and a half tops. And it takes the Borribles multiple DAYS to cover the I remember this as being a lot better than it was. One of my issues is the inclusion of the map at the front of the book. Yes, it's nice to have one, but it also made me realise that they essentially cover 3, maybe 4 miles (as the crow flies)... a distance that could very probably be walked by a moderately fit adult in an hour, hour and a half tops. And it takes the Borribles multiple DAYS to cover the same ground. Essentially they could have walked to Rumbledom the first day. Also, the ending is both very anticlimatic and very "tell don't show"... it's also totally setting up the first of the two sequels that emerged from this book. On top of that I find barely any of the characters memorable, beyond Knocker and Napoleon Boot... you have a cast of ten "main" characters... they should be unique and distinct, but they just don't feel that way, especially the girls. Also, side note, I know this was written in 1976 but there is some serious casual sexism going on in this book... firstly, why is it really only the two female Rumbles/Borribles who have gendered names (Napoleon notwithstanding, he's named after a historical person, so I'm not counting him)... one of the male Rumbles/Borribles is named after a river for goodness sake, but no, the girls have to be girls and go after the girl Rumbles because they have girl names. And then the only really character trait given to either of the girls is that she loves horses. Well, a specific horse. And I can't even remember which of the girls. And both the female Rumbles are found and defeated in the kitchen. Because women. It's a weird book, the action seems to given slightly more weight outside of the actual battle with the Rumbles (the sequence before with the Snatcher and the sequence after with the Wendles), and the Rumble battles don't feel particularly thrilling because there isn't really even a threat of anyone dying (and I don't even think that I was just remembering that part of the story). And the end just handwaves and says "oh, yeah, everyone was fine but now these four totally die offscreen by the way... unless they show up in the sequel for some reason... then they don't". I knew of 'the Borribles' thanks to China Miéville,who aknowledges de Larrabieti as one of the inspirations for his own work. After having read the first of the three novels of the trilogy I can say that I really enjoyed most of it but there was a very important flaw that really spoilt the pleasure of exploring this other literary alternative London. (view spoiler)[When the Borrible commando storms the Rumble bunker I found it extremely disappointing how easy was for them to find and kill their I knew of 'the Borribles' thanks to China Miéville,who aknowledges de Larrabieti as one of the inspirations for his own work. After having read the first of the three novels of the trilogy I can say that I really enjoyed most of it but there was a very important flaw that really spoilt the pleasure of exploring this other literary alternative London. (view spoiler)[When the Borrible commando storms the Rumble bunker I found it extremely disappointing how easy was for them to find and kill their targets -being as they were the eight main enemies, the most important ones, the leaders- without additional protection among thousands of Rumbles. In a fantasy novel you can believe the unbelievable, but you should not go against the internal logic of your world; it could have been much better prepared and deployed. (hide spoiler)] When I was reading it I could not believe that that part had been written by the same author as the rest of the book. 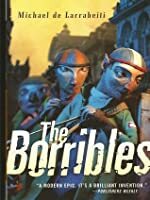 I first read "The Borribles" when I was 11, and fell in love with the anarchic tale of scruffy street kids launching a commando-style assassination strike on a race of subterranean rat-creatures. I'm still a fan as an adult, even if I do now tend to notice some of the probability-stretching conveniences of the plot, and the rather inconsistent characterisation of the antagonists (though at least, as an adult, I realise who they are a pastiche of). I re-read this after 30 years, having dug it out for my daughter. Enjoyed it more than ever. For some reason I did not make the connection between Rumbles and Wombles as a child (Wombles were just a little before my time) - getting the joke now just makes it more fun. There should be more murderous effin' street urchins in modern kid's books, and less fairy princess unicorns. It’s a cracking good read, as the kids never said, and is remarkably grim and bloody for a story aimed at the schoolboy set. And the ending is quite cynical. No wonder the kids back in the day liked it. What an ending; loss after loss. It was most definitely not a Disney ending - which in some ways is more satisfying. Gotta steal a quote from elsewhere because it described this book perfectly: 'It was grunge before there was Grunge'. Nuff said. Gritty, witty and charming to the core. Where has this book been my whole life? I LOVED the Borribles, and to be honest with you I'm not sure why. I don't know if it's the adventure, the unique world, or strange characters that just... kept me reading, but I loved it. It is time to jump in the way back machine and take a look at another 'oldie but goodie' book. This time I am featuring The Borribles, which is the first book in The Borrible Trilogy. The Borrible Trilogy is a gritty children's/YA urban fa Where has this book been my whole life? I LOVED the Borribles, and to be honest with you I'm not sure why. It is time to jump in the way back machine and take a look at another 'oldie but goodie' book. This time I am featuring The Borribles, which is the first book in The Borrible Trilogy. The Borrible Trilogy is a gritty children's/YA urban fantasy series. What if Peter Pan's Lost Boys were street urchins? The Borribles could be described as an urban version of Peter Pan's Lost Boys. Borribles look like children, and can only be differentiated by their pointy years. All Borribles were children one day, but they turned into these curious creatures after running away to live on the streets of the big cities. If they are not captured, Borribles never age and live forever. They are barred by social taboos from having money, so they steal everything the What if Peter Pan's Lost Boys were street urchins? The Borribles could be described as an urban version of Peter Pan's Lost Boys. Borribles look like children, and can only be differentiated by their pointy years. All Borribles were children one day, but they turned into these curious creatures after running away to live on the streets of the big cities. If they are not captured, Borribles never age and live forever. They are barred by social taboos from having money, so they steal everything they need or desire. This book from 1976 in an underground classic of English young adult literature. It never really achieved wide success, most likely because of the surprising amount of violence in a book directed to children and teens. There are passages with brutal beatings and several bloody deaths. But the book is fun, there is no denying that. The Borribles have a tribal structure in their society, with different neighborhood leaded by informal representatives. In this first book, the Borribles get together after scouts capture a Rumble, anthropomorphic rats that the Borribles hate, and they decided to assemble an elite group to assassinate the rat leaders in the town of Rumbledom. Writer Michael de Larrabeiti, who died in 2008, build his narrative in a fast and evolving way. The characters are interesting individually, but the group in the end form bonds of friendship that seemed to me similar to the fellowship of the ring of Lord of The Rings. The idea of the journey was equally epic, as the group faced several dangers until they get to Rumbledom for a final showdown. The book is centered on the actions rather than the descriptions, and that gives a welcome speed to the story. Summary: The Borribles of Battlesea discover a Rumble tunneling inside of Battersea. Now, for clarification a Rumble is really just another type of Borrible but with two distinct differences: 1) They are from Rumbleton and 2) they prefer to live in burrows instead of old boroughs. Skiff the commander of the Battersea Borribles takes the trespass of the Rumble and uses that as an excuse to invade the main burrow in Rumbleton as a preemptive attack instead of waiting to be attacked. In reality Spiff is wanting to steal a great treasure that is hidden in the Rumleton's commanders living quarters. 8 Borribles are chosen to go on this adventure. One additional is included to be the "historian" but in reality is secret mission is to steal the treasure box. 9 take out on this misfit adventure and the meet a german Borrible along the way. Such a wonderful tale that I do not want to go into further details for fear of ruining this simple and easy read. I wasn't sure what to expect when I started reading this book. Quite frankly, I was pulled into the strange world of the Borribles quite quickly and, once acclimated, the fine writing encompassed me. This is a distractingly good book. The Borribles are creatures about the size of grade school child and live on, around and in the midst of the city of London. They are somewhat like the Borrowers in that they live off of what they can steal and they hide their existence from the sight of us normal I wasn't sure what to expect when I started reading this book. Quite frankly, I was pulled into the strange world of the Borribles quite quickly and, once acclimated, the fine writing encompassed me. This is a distractingly good book. The Borribles are creatures about the size of grade school child and live on, around and in the midst of the city of London. They are somewhat like the Borrowers in that they live off of what they can steal and they hide their existence from the sight of us normal folks. Their territory is invaded by another race of small people called the Rumbles and they go to great lengths to defend their territory. There is action, adventure, tragedy, triumph and just a touch of romance. It's a creative and ultra-violent fantasy novel. You could probably compare it fairly accurately to the first half of Ender's Shadow, but with way more violence and giant rats. Probably 30-40% near the end is actually just one big battle, but the violence is creative and entertaining. If you enjoy fantasy violence and unique settings, you'll probably like this one. This review has been hidden because it contains spoilers. To view it, click here. Hmm. People looooooove this, but I'm not certain I did. I was pretty put off by the violence. There's talk of goo coming out of skulls! While we don't see the "other side" really do anything bad at all, we see the Borribles do some pretty bad things. I'm going to keep reading the series, but if the first book wasn't a setup to show corruption and peer pressure and xenophobia, I'll probably stop after the next one. I love Larrabeiti's voice and tone in The Borribles. I was so pleased that it wasn't as childish as it could have been (what I was half expecting) but was instead very dark and gritty. There's plenty of action, adventure, triumph, and tragedy to draw in a wide variety of readers. I'm looking forward to reading the second and third books in the series. What a pleasant surprise! Loved these books when I was 10 or so. Not quite as enthralling as I remember, but that's only to be expected. My favourite was "The Borribles Go For Broke", which I read first, so this always had the feel of a prequel at the time. I'll be reading it next. A fun, yet violent romp. Street urchins, who are a mix of Peter Pan's lost boys and the pick pockets from Oliver Twist, plan revenge on the nasty Rumbles. Plodding around London with their trust catapults they fight to perserve their way of life and to earn their names. Michael de Larrabeiti was an English novelist and travel writer. He is best known for writing The Borrible Trilogy, which has been cited as an influence by writers in the New Weird movement. “Normal kids are turned into Borribles very slowly, almost without being aware of it; but one day they wake up and there it is. It doesn't matter where they come from as long as they have what is called a “bad start.” A child disappears from a school and the word goes round that he was “unmanageable”; the chances are he is off managing by himself. Sometimes it's given out that a kid down the street has been “put into care” because whenever he got home from school the house was empty; no doubt he's been Borribled and is caring for himself someplace. One day a shout might be heard in a supermarket and a kid with the goods on him is hoisted out by a store-detective. If that kid gets away he'll become a Borrible and make sure he isn't caught again. Being caught is the end for a Borrible.